This article is co-authored by Jeffrey Lewis, Melissa Hanham and Amber Lee. On April 15, 2012, North Korea paraded what appeared to be six road-mobile missiles, quickly identified in the media as KN-08 intercontinental ballistic missiles (ICBM), through Kim Il Sung Square in Pyongyang. Attention immediately focused on these unusual vehicles, after Chinese bloggers identified them as Chinese-manufactured transporter-erector-launchers (TELs) used by Beijing’s strategic missile forces. Officials in Beijing initially denied exporting “any items prohibited by relevant UN Security Council resolutions and Chinese laws and regulations.” However they later stated that the Chinese firm in question had only exported civilian-use chassis, which can be used for a variety of civil purposes, including logging and construction. Although the chassis export appeared to violate sanctions on North Korea and Chinese domestic law, the Chinese showed evidence that the North Koreans had provided the name of a false end-user for the vehicles, a standard tactic for evading export controls, and stated that North Korea had added the erectors and other specialized equipment to the chassis themselves. It is possible, using open source information, to make some preliminary judgments about China’s claim, as well as North Korea’s infrastructure for producing TELs. Although it is hard to believe that the Chinese were not aware that North Korea would use the vehicle chassis for its illicit missile program, available evidence suggests that Pyongyang did indeed add the erectors at facilities known to assemble missile TELs. Following the April 2012 parade, Chinese officials told the United Nations Panel of Experts charged with monitoring sanctions enforcement that a Chinese firm, the Wanshan Special Vehicle Company (WSV), had exported six heavy-duty vehicle chassis to North Korea in 2011. The delivery appears to have been made in two shipments: two chassis in May 2011 followed by another four in October 2011. In retrospect, information concerning the shipments was available in the public domain. The State-owned Assets Supervision and Administration Commission of the State Council (SASAC or 国资委) announced the export of heavy-duty vehicle chassis to an unnamed foreign customer at the time of the sale, as did WSV. Neither statement mentioned the number of chassis or the identity of the customer, but they did indicate that the recipient—China’s first foreign customer for such vehicles—paid 12 million RMB in advance on a 30 million RMB order. Chinese officials subsequently claimed that Pyongyang had told them that the vehicles were to be used in logging by the Ministry of Forestry. Although the story is difficult to believe, logging and construction are plausible civil uses for these otherwise highly specialized vehicles. For all photos, click to enlarge. Photo (left) KCNA; (right) wstech.com.cn. One question that remained was whether the Chinese exported fully assembled launchers, or, as Chinese officials claimed, just the chassis-and-cab assembly, leaving North Korea to mount the launcher and other specialized equipment. In 2013, North Korea released a commemorative video entitled, Kim Jong Il’s Efforts to Defend the Country, posted by pro-North Korean groups on YouTube. Although it is strange to think of North Korea using social media extensively, the country’s state-run propaganda apparatus and affiliated groups in foreign countries make extensive use of such platforms to share and distribute the regime’s propaganda internationally. This propaganda also can provide outside analysts with important clues about activities in the North that otherwise are off limits to foreigners, for example, factories where North Korean leaders conduct field inspections. Kim Jong Il’s Efforts to Defend the Country contains the only known footage taken inside North Korea’s facility for completing assembly of TELs for ballistic missiles. 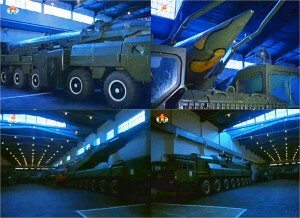 Three clips lasting a few seconds show Nodong TELs inside a spacious, rectangular, high-bay building as well as a KN-08 TEL in a very similar building. Kim Jong Il appears in some frames, looking at a Nodong TEL. The first analysis of the film, along with still images, appeared on North Korea Leadership Watch, a website which regularly analyzes North Korean propaganda. Because the internal images show a distinct building, it is possible to model the outside of the structure by first simulating the inside. First, along one of the long sides of the building there is an unusual pattern of clerestory windows—high windows above eye level—as well as the cupola-like structure near the center of the building. Second, windows run along only one of the long sides of the building, suggesting that it is either partially buried or has an adjoining structure on the opposite side. Finally, the windows along the short side of the building are spaced in an irregular manner and make an identifiable pattern. Referencing the video footage, we digitally constructed the building interior on SketchUp, a free, widely-available 3D modeling program. This rendering revealed the structure’s approximate dimensions, and based on the windows and roof, suggested that the two clips may have been filmed in different buildings. Images (top) KCTV, “Kim Jong Il’s Efforts to Defend the Country”; (bottom) Melissa Hanham/ James Martin Center for Nonproliferation Studies at the Monterey Institute for International Studies. Combining what we knew about the windows, roof, and building dimensions, we created external models of the two buildings—one with a square cupola, and another with a larger cupola spanning the width of the roof. Images: Melissa Hanham/James Martin Center for Nonproliferation Studies at the Monterey Institute for International Studies. Once the configurations of the structures were identified, the next question we addressed was, where might such unusual buildings be located? Google Earth houses an enormous repository of high-resolution satellite and aerial images, including fairly comprehensive coverage of built-up areas of North Korea. Additional images can be purchased from other providers, such as Astrium. The only problem is where to start looking. 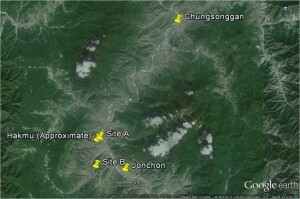 Image: 38 North: DPRK Digital Atlas. For example, Ko Chong Song, a North Korean defector, published a book in Japan describing the locations of defense enterprises, stating Pyongyang produces “missile launchers” at the No. 81 Factory located in the “Chungsonggan workers’ district, Songgan County, Chagang Province, about 2.5 to 3 kilometers from Songgan-up.” However, Ko cautions that the No. 81 Factory may only produce some components for launchers with final assembly done elsewhere. 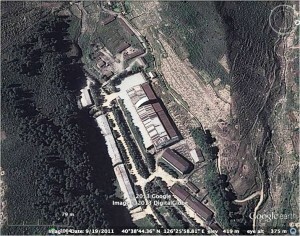 Another account, posted online by an anti-DPRK dissident group, describes a gruesome incident of cannibalism at the “No.11 munitions factory (Hakmu worker’s district 6 km northwest of Jonchon, Jagang) where missile launchers are manufactured…” Jonchon and Songgan are close to one another, lying about 10 kilometers apart along a river valley. 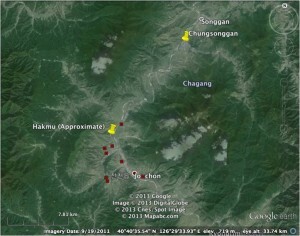 Songgan, Chunsonggan and Jonchon (Chonchon) all appear in the Gazetteer maintained by the National Geospatial-Intelligence Agency. Hakmu does not—although the description of the place as about 6 kilometers northwest of Jonchon is consistent with a mention in a survey conducted by UNICEF and the World Health Organization. Ko also mentions Factory 11—although he claims it is near Songgan. All of these locations are within a few kilometers of each other, creating a manageable search area centered on the river valley between Songgan and Jonchon, particularly the Chungsonggan and Hakmu Worker’s Districts, which lie between the two locations. There are other possible locations mentioned in defector accounts, but this is the only cluster of possibilities. This became our initial search area. While the ten kilometers along the river valley between Jonchon and Songgan represent a manageable search area, it was further simplified through crowdsourcing. The social media site Wikimapia and the North Korea Uncovered KMZ file offered by North Korean Economy Watch provide the locations of many known defense sites, including surface-to-air missile installations. Although the No. 81 and No. 11 Factories are not listed, clusters of surface-to-air missiles sites often help identify locations that the North Koreans regard as important enough to warrant air defenses. The area six kilometers northwest of Jonchon—consistent with the location of the Hakmu Worker’s District—appears to be well-defended so our search started there. Image © 2011 Google Earth. Less than one kilometer from a surface-to-air missile site, and 4.6 kilometers northwest of the Jonchon train station (a proxy for central Jonchon), lies a building located at 40°38’44″N, 126°25’58″E that matches one of our models. We will call this structure Site A. Several interesting details emerge right away looking at the satellite imagery. The Site A building is a close match based on the modeled dimensions and the windows. The building has a single row of high, clerestory windows because the main building has an adjoining structure. The completely windowless opposite side appears to be flush with another hall. The windows at the eastern short end match very closely. The large cupola is revealed to be a curved, fan-like structure (consistent with the arc made by the tip of an erecting missile on a TEL inside). As it turns out, the two different roofs are actually from the same building. Satellite images show that North Korea remodeled the roof at Site A between 2004 and 2011—probably at the same time it negotiated for the export of the KN-08 chassis. Most conclusive, was the fact that a KN-08 missile could easily be erected on a launcher under the 2011 cupola, where the previous 2004 cupola could only support the shorter Nodong missile. Frank Pabian and Tamara Patton built a model of the KN-08 TEL and missile using parade images and SketchUp. Wanshan’s original marketing materials for the WS51200 chassis also included specifications, thus they were able to scale the model to the correct size. Image: “KN-08 TEL Model,” Frank Pabian and Tamara Patton, 2012. This detail not only provides strong confirmation of the site’s purpose, but indicates that China probably only exported the bare chassis. It would seem the launcher modifications were added here near Jonchon. Image: Frank Pabian/Tamara Patton/Melissa Hanham/James Martin Center for Nonproliferation Studies at the Monterey Institute for International Studies. Working with 38 North, we purchased new satellite images, including a low-angle view that shows the windows running alongside the south of the building. They are not evenly spaced, presenting the opportunity to match the inside of the building with the outside. The matching window pattern is strong evidence that the KN-08 launchers seen in the video were located in the building at Site A. The windows in one video clip of the Nodong launcher, however, do not seem to match. In particular, one image shows a Nodong with a row of continuous windows behind it. It is possible that the windows were altered when the roof was remodeled. There is, however, another possibility. In addition to the building at Site A, we found a nearly identical building a few kilometers away at what we call Site B (40°36’43″N, 126°25’34″E). This structure appears to be located in the same industrial facility, which is spread out over many square kilometers in the river valleys. This roof was also modified to receive a new cupola sometime before 2011. Images © 2004, 2011 Google Earth. Image © 2008 Google Earth. 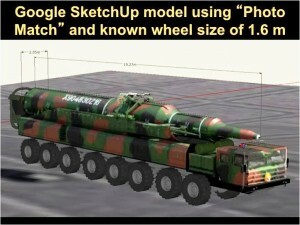 While much remains unknown about North Korea’s infrastructure for producing ballistic missiles and launchers, a persistent analyst can identify the primary facilities for ballistic missile TEL assembly by referencing various resources—in this case, footage available online, a 3D modeling program, published defector accounts, mapping projects, and satellite images. In isolation, none of these tools would offer much insight into North Korea’s nuclear and missile programs. Together, they make it possible to establish with high confidence when and where North Korea fixed the erectors and launchers to imported Chinese heavy-duty vehicle chassis. Many of these steps were already possible but labor-intensive (perhaps prohibitively so). Today, nearly all of the necessary information is available to any nongovernmental analyst with a decent internet connection. Satellite images purchased from private companies can simply be downloaded. Questions can be asked, and answered, by email or social media. Images and models can be shared online. Our team operated virtually, using email and Dropbox to connect participants from offices in Monterey, California; Washington, DC; and Vienna, Austria. The result helps answer an interesting policy question—yes, the North Koreans added the KN-08 launch hydraulics—but more importantly, this analysis illustrates both the new realities and opportunities for open source research in the field of arms control, nonproliferation, and disarmament. Jeffrey Lewis is Director of the East Asia Nonproliferation Program at the James Martin Center for Nonproliferation Studies (CNS), Monterey Institute of International Studies. Melissa Hanham a Research Associate in the East Asia Nonproliferation Program at CNS. Amber Lee is a Graduate Research Assistant at CNS. This publication results from research supported by the Naval Postgraduate School’s Project on Advanced Systems and Concepts for Countering Weapons of Mass Destruction (PASCC) via Assistance Grant/Agreement No. N00244-13-1-0012 awarded by the NAVSUP Fleet Logistics Center San Diego (NAVSUP FLC San Diego). The views expressed in written materials or publications, and/or made by speakers, moderators, and presenters, do not necessarily reflect the official policies of the Naval Postgraduate School nor does mention of trade names, commercial practices, or organizations imply endorsement by the US Government. See: Joshua Pollack, “North Korea’s ICBM Unveiled,” Arms Control Wonk, April 15, 2012, http://pollack.armscontrolwonk.com/archive/3932/north-koreas-icbm-unveiled. “Foreign Ministry Spokesperson Liu Weimin’s Regular Press Conference on June 13, 2012,” Ministry of Foreign Affairs of the People’s Republic of China, June 14, 2012, www.fmprc.gov.cn; Mark Hibbs, “China and the POE DPRK Report,” Arms Control Wonk, July 2, 2012, http://hibbs.armscontrolwonk.com. Melissa Hanham, “North Korea’s Procurement Network Strikes Again: Examining How Chinese Missile Hardware Ended up in North Korea,” Nuclear Threat Initiative, July 31, 2012, http://www.nti.org/analysis/articles/north-koreas-procurement-network-strikes-again-examining-how-chinese-missile-hardware-ended-pyongyang. Annex XII includes a copy of the end-user certificate received by China. United Nations, “Report of the Panel of Experts Established Pursuant to Resolution 1874 (2009),” S/2013/337, June 11, 2013, pg. 80, http://www.un.org/ga/search/view_doc.asp?symbol=S/2013/337. United Nations, “Report of the Panel of Experts Established Pursuant to Resolution 1874 (2009),” S/2013/337, June 11, 2013, http://www.un.org/ga/search/view_doc.asp?symbol=S/2013/337. Asahi later obtained documents that suggested from the second shipment of four vehicles in October 2011. Yoshihiro Makino, “Chinese Shipper May Have Ties to N. Korean Arms Dealer,” Asahi, June 25, 2012, http://ajw.asahi.com/article/asia/china/AJ201206250007. It would not be unusual to pay 6 million RMB each for the first two vehicles, then less for the next installment of four (18 million RMB total). “中国航天科工研制成功国内最大越野运输车 [CASIC Successfully Develops Country’s Largest Off-road Vehicles,” State-owned Assets Supervision and Administration Commission of the State Council of the People’s Republic of China, May 26, 2011, http://www.sasac.gov.cn/n1180/n1226/n2410/n314319/13551197.html; Note: Hubei Sanjiang Space Wanshan Special Vehicle Co. Ltd took down its announcement: http://www.wstech.com.cn/en/show.asp?id=734. See also:“九院：首次获大型非公路运输车批量出口订单 [China Sanjiang Space Group (9th Academy): First Order of Heavy-Duty Off-Road Trucks],” China Aerospace Science & Industry Corp., October 19, 2010, http://www.casic.com.cn/n16/n1115/n2888/548509.html; “湖北三江航天万山特种车辆有限公司 [Hubei Sanjiang Space Wanshan Special Vehicle Company, Ltd.],” China Sanjiang Space Group, 31 March 2011, http://www.cssg.com.cn/Item/235.aspx; “湖北三江航天万山特种车辆有限公司 [Hubei Sanjiang Space Wanshan Special Vehicle Company, Ltd.],” Yuan’an County Economy, Trade and Information Bureau, July 23, 2009, http://jjsw.yuanan.gov.cn/art/2009/7/23/art_876_25463.html. Rodrigorojo1, “KCTV (Kim Jong Ils Efforts to Defend the Country),” YouTube, uploaded August 24, 2013, https://www.youtube.com/watch?v=bQKFC7pK3wc. Michael Madden, “DPRK Documentary Film Shows Kim Jong Il Inspecting Nodong, KN-08 Missiles,” North Korea Leadership Watch blog, August 28, 2013, http://nkleadershipwatch.wordpress.com/2013/08/28/dprk-documentary-film-shows-kim-jong-il-inspecting-nodong-kn-08-missiles. 高靑松 中根悠 [Chonson Ko and Yu Nakane], 金正日の秘密兵器工場： 腐敗共和国からのわが脫出記 [Kim Jong Il’s Secret Weapons Factory]. 東京 [Tokyo]: ビジネス社 [Bijineshusha], 2001. “김정일이 죽든 내가 죽든 둘 중 하나 [Either Kim Jong Il or I will die],” DailyNK, December 5, 2005, http://www.dailynk.com/korean/read.php?num=15656&cataId=nk00300. The Gazetteer is available online at: http://earth-info.nga.mil/gns/html/namefiles.htm. Stephen K. Lwanga, “EPI Coverage Evaluation Survey—2008, Democratic People’s Republic of Korea,” UNICEF, December 2008, http://dev.undprk.matth.eu/content/uploads/2012/04/EPI-Coverage-Evaluation-Survey-2008-DPR-Korea-Final-Report.pdf. CNS built a model of the Nodong TEL, using components from: Abel Nightroad, “苏联SS-1c“飞毛腿”导弹发射车(SS-1c ‘Scud B’wMAZ-543 Tel),” 3D Warehouse, January 5, 2010, http://sketchup.google.com/3dwarehouse/details?mid=6c2184e69080ea072d5c0718d7322deb. “外交部回应朝鲜最新导弹发射车来自中国传言 [Ministry of Foreign Affairs to Respond to Latest Rumors about North Korean Missile Launch Vehicles],” Phoenix News (Hong Kong), April 20, 2012, http://news.ifeng.com/mil/2/detail_2012_04/20/14031451_6.shtml. See for example: Frank Pabian, “Making Discoveries in Virtual Worlds via the Cloud,” Earth Imaging Journal, October 2013, http://eijournal.com/2013/making-discoveries-in-virtual-worlds-via-the-cloud.